Brian Lonano, the mastermind behind the killer Attackazoids! underground film series, has a new project created with Kevin Lonano, which is embedded above. It’s called 8bit Ghost Hop! and I promise that this super groovy little video will be bopping around in your head long after you’ve watched it — music and visuals included.Like Attackazoids!, 8bit Ghost Hop! relies on old school special effects, like puppet miniatures, which makes this short video endearingly charming. The little ghosts are especially cute, too. 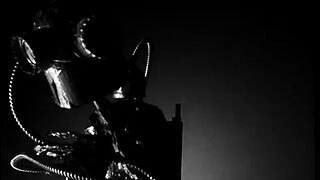 However, the video also strangely reminds me of David Lynch‘s Eraserhead where Hop!‘s robotic alien controller at, what I’m guessing is, the center of the moon resembles Eraserhead‘s Man in the Planet working his giant levers.